Salmon Cakes are somewhat of a comfort food to me. Growing up, at least one lunch a week was either a salmon cake or a fish cake. Where we lived, this was commonplace and also something that my grandmother loved to eat for lunch and to feed to us. While the childhood salmon cakes I remember were indeed made with canned salmon, that is probably where the similarities to my version end. They were nothing more than canned salmon, bread crumbs, a small white potato, an egg or two and some salt and pepper. And, when made by my grandmother, they were heavily pan-fried and served on an old-school potato hot dog roll with ketchup. Yep. My Paleo Salmon Cakes do indeed use canned, wild salmon but have fresh herbs, spices, some sweet potato, eggs and a bit of almond flour to hold them together. They are cooked on the stove top so that they have a nice crispy crust and in only enough fat to keep the insides nice and moist. These were inspired by one of my readers (Hi Janet!) who emailed me a couple of months ago and asked me to post a good, healthy, clean salmon cake recipe. I keep a list of reader requests so I had salmon cakes on the brain. That combined with this #Whole30 adventure finally made it happen. There is a salmon cake recipe in the book (It All Starts With Food) that I used as a base to develop this version. I like to call these weeknight salmon cakes because they don’t take much time and you can make them in advance. Additionally, you can make a double (or even triple!) batch and freeze a bunch of servings (uncooked) for later. Which is always a bonus when you are busy! I like to buy the canned wild salmon in water with the skin and the bones. The only reason is cost. It is about $2.99 a 14.75-ounce can vs. $3 something for a MUCH smaller can without the skin and the bones. I like to remove the skin and bones but a lot of poeple don’t even bother and just crush it up along with the salmon. Alternatley, if it’s too gross to deal with or you don’t care about the additional cost, just buy the skinless, boneless. I have tested this recipe with both almond meal (ground up raw almonds with their skins) as well as tried it with almond flour (ground blanched skinless almonds that is finer and more powder like). I prefer the texture of the almond meal. If you don’t have it (Trader Joe’s sells it for about $4 per pound), just process some almonds in the food processor until they are almost powdery and like a meal but before the fat releases and it becomes almond butter. Or just use the Almond Flour or any other Flour (except Coconut) that you have. I have also made these with smoked paprika and they are awesome. Wash sweet potato and use a fork to poke several fork-holes in it. Wrap in a paper towel, place on a microwave safe plate and microwave until soft. My microwave has a "potato" setting. I think it's about 8 to 9 minutes long but check every couple minutes so you don't overcook it. If you prefer not to use the microwave, you can cook the potato in advance when the oven is on and keep it in the fridge (mashed and ready) for a couple of days. Let cool for a few minutes, remove potato flesh from skin and mash with a fork until the lumps are mostly gone. Toss into a large mixing bowl. Add almond meal, chopped parsley, onion, lemon juice, hot sauce, salt, cumin, paprika, black pepper and eggs (Be sure not to put eggs directly on hot potato flesh or they can begin to cook!). Warning - gross looking salmon skin and bones pictures coming. This is how I quickly and easily remove the majority of skin and bones from the canned salmon. See NOTES above for more about this. Open the cans and drain most of the liquid out. Take the canned salmon into your hand and look for the "split" where 2 or more pieces of salmon are pushed together into the can. This is the natural place to separate the salmon and where you will most likely find the majority of skin and bones. Use your hands to gently scrape the skin and bones off. Separate the salmon again if there are more "splits" and do the same thing.Finally, using your hands, crush the canned salmon through your fingers into the mixing bowl. Use a 1 / 3 measuring cup, scoop out evenly sized salmon cakes (flatten bottoms) until you have 12 patties. Chill in the refrigerator for at least 30 minutes or all day (this is also the point you would freeze any that are not going to be cooked in the next 12 to 24 hours). Heat a large frying pan (big enough to hold six patties) over medium high heat. Once hot, add 1 tablespoon coconut oil or Ghee per six patties. Let fat completely melt and get very hot. Slowly add patties and cook for 4 minutes. Gently flip and cook for an additional 4 minutes on the other side.Serve hot and Enjoy! What a great easy meal for busy nights! Thanks for sharing! You’re welcome! So glad you like them Christina! Great idea to put sweet potato in them! Fish cakes remind me of childhood too! We are working hard to change our diet to eating more healthy! These were amazing! So glad to hear it Shari Lynne!!! I never thought to use sweet potato before and was a little unsure but thought why not? Great choice! It really made for a smooth texture. Thanks for the recipe! I absolutely love salmon cakes and using canned salmon makes it that much easier! So glad you like them Kelly!! These were so light and fresh tasting. I used the almond flour but will definitely try the almond meal next time. This is my kind of comfort food! And I might try this recipe with whole wheat flour. I made these tonight when we had my son and his girlfriend over for dinner. He has some autoimmune issues so I try to cook things that are anti-inflammatory and especially nutritionally beneficial for him. 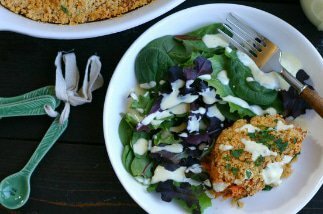 I just want to say that these salmon cakes (with the almond meal) were a real hit with everyone. We served them with an avocado-cilantro-Jalapeno-Lime sauce, which turned them into a fancy and delicious guests-for-dinner meal. Thanks for the recipe! Hi Heather! Thanks for taking the time to let me know – I am so glad the salmon cakes were a hit! I’ve made these a hundred times, and they are so delicious! I usually use fresh ground whole wheat. However, we are eating low carb right now, so I used 1/2 garbanzo bean flour and 1/2 almond flour and was so surprised at how amazing they turned out. Thanks for this recipe. It’s a staple in our house! Oh, and I crush up the small bones and skin with my fingers. They are really good for your health. Eat them! Hi Leah! That sounds so yummy – thanks for taking the time to let me know – so happy to hear you are enjoying this recipe! I was wondering, can I use whole wheat pastry four instead of almond flour? If so, is the ratio the same? Can I bake these and if so, at what temp? Also, can I freeze some of these “cooked” rather than uncooked? Hi Anna! How did it go with the egg whites? I’m making them today (in a few hours actually) so I will let you know. I had to pick up more salmon ~I thought I had in the freezer but I did not. Still looking forward to making these. Do you know anything about using egg whites? Thanks again will update you! The egg whites should work just fine as the whole egg is meant as a binder. I would add 1 tsp of olive oil along with the whites though as the yolk adds some extra fat and moisture! Delicious recipe! A new home staple! I used whole wheat pastry flour and the egg whites! Fabulous dish!!!!!! Question: when cooking the frozen salmon cakes, do you allow them to defrost in the refrigerator first and then cook per instructions? Or can they be cooked direct from the freezer? Any cook time difference? Thank you! Either way works! If you cook them from frozen, start with low heat, put a lid on them and then once defrosted, remove the lid and raise the heat to brown them again! I just made these and cannot get over how delicious they are. I will be making these salmon cakes for a very long time. Thank you! Thanks so much Christina – so glad to hear it!!! I’ve been using this recipe for the past year and decided to finally comment! We LOVE these salmon cakes! This recipe is straightforward, relatively simple, and so delicious! Our Kroger stores carry a relatively wild caught Alaskan pink canned salmon and I buy the Trader Joe’s almond meal. It always turns out great and is a family favorite. I recently found another recipe that bakes the salmon patties rather than frying them, and I have to admit they taste just as good baked, and it’s less hassle. I still use your recipe for the ingredients and prep, though, because I don’t want to try anything else!! Thank you! Massively behind the times on these! I never comment on online recipes that I use, but these cakes were so awesome and the photo instructions were very useful. We used almond flour (since we had it on hand) and they turned out great nonetheless. Also used shallot so we didn’t have to crack open an onion for the two tablespoons, and man oh man. So glad you loved them – that sauce sounds incredible! Thanks for taking the time to leave me a comment – I appreciate it! I have a delightful fish market nearby that has the most spectacular brine for their smoked salmon and they occasionally have Lake Superior salmon which is my favorite. Do you think smoke salmon would work with this recipe? I would also like to try it with some fresh Lake Superior white fish. I wonder if I should use about 1.5 lbs of cooked white fish? I can’t wait to try it! Thanks for fish deliciousness!! These were delicious! My husband asked for a third helping and kept commenting on how delicious they were and said I had to make them again! I’ve tried plenty of salmon patties, and he loved these way more than any I have ever made. I did substitute cumin and curry and tarragon for spices, my fav go to’s. Next time I will try the smoked paprika. Loved the consistency with sweet potatoes….great idea! Thanks! Glad you both loved them Gloria and your spice substitution sounds tasty! Nut allergy in our family. What about chia seed or gel in place of almond meal? Hey! I would sub cassava flour or gluten free flour. Also, I haven’t tried it but if you read through the comments, I remember at least one reader saying that they have had success using coconut flour. Good luck! I am on day 11 of whole 30 and bored with my menu, I thought about salmon cakes and did a search. Your recipe is what it came up with and I am so glad! I made them exactly as you outline other than I didn’t have hot sauce so used cayenne instead and they were fantastic! Thanks so much for this recipe! I served mine over a bed of spring mix lettuce and a bit of homemade balsamic vinagarette. Hi Heidi! So happy to hear you loved them! I have an entire Whole30 section if you still need more ideas. Good Luck! After reading all the comments I can’t wait to try these! Not a sweet potato fan but I’m excited to try and then try again with butternut squash. If buying the skinless, boneless salmon, what size cans? I have some in my cupboard. You need about 28 to 30 ounces total so I usually use two of the large cans (I think they are 14 or 15oz each). Hope you love them Sheri! Have you ever tried baking these in muffin tins? Any reason you chose to fry instead of bake? Different flavor? Take the skin off, but always crush up the bones it is a good source of Calcium. It crunchs up nice, I never throw it away..
My mom does the same! I’m looking forward to trying these but wondering why remove the bones? We buy calcium pills made from bones and these little pieces are just raw calcium in my opinion. It doesn’t deter from the taste. Eat what nature gives you in that little can. Most people agree with you and that is how they make them! My mom and grandmother always left the bones in too. I also felt that the cakes held together much better if dredged slightly in almond meal prior to frying. I served them as appetizers by making very small salmon cakes to serve at a dinner party. Went over quite well. My son likes salmon patties best dredged in almond meal prior to frying – would that be before the 30-min chill time, or after? 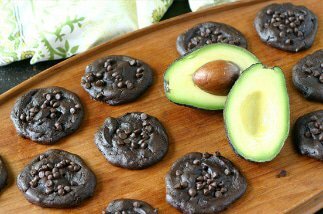 I would dredge them right before frying so the almond flour doesn’t get soggy! Made half of the recipe to try it out. Put them in the refrigerator for a couple of hours. Had one for lunch and a salad and they were delicious! Love the fact that they are healthy. Couldn’t taste the sweet potato or the almond meal. I have the rest in the freezer and will use my FoodSaver to store them individually and have them on hand whenever I want one. Awesome Sonia! LOVE the idea of using the FoodSaver to store them individually. Thank you for your recipe! I was wondering if you can leave out the sweet potato, but everything else? Hi Luisa – A lot of readers have had success swapping white sweet potato or regular russet potatoes! It acts as a binder. I’ve tried it without potato and the cakes tend to fall apart. Do you think substituting butternut squash for the sweet potatoe would work as well? You know I am not sure. Butternut squash is a lot more watery and has less starch so it may not work as well. If you try it, come back and let me know how it works out! You can definitely use butternut squash in place of the sweet potato. It should be mashed or puréed before mixing with the salmon. It’s delicious. so glad to know this about the squash. I don’t have a sweet potato in the house, and the squash is already in the oven before I read this helpful comment. Nice to know since company is coming! Love this recipe, making for the second time. I use fresh arctic char (I live north of the arctic circle), or fresh whitefish either way, makes a FABULOUS burger/fish cake. And yes, as one of the other readers mentioned….using fresh fish means you need to add a bit more almond meal. Cheers, and thanks again. Wow, these are amazing! Thank you so much for posting it with the pictures! My hubby and I HATE HATE HATE sweet potatoes, but after seeing the comments saying you can’t even tell, I went against my internal alarm and bought a sweet potato for this recipe. So glad I did! The hubs requested that this become a weekly sight. Having this as a go-to recipe is going to make the rest of this Whole30 even better! THANK YOU!! !